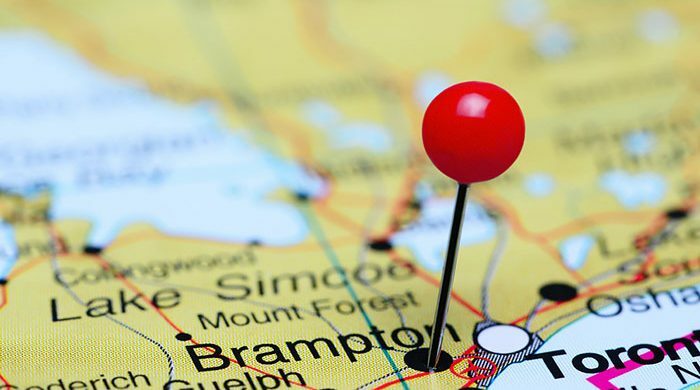 More and more people are moving to Brampton, Ontario. According to statistics gathered by U-Haul, Brampton ranked # 13 with most number of truck rentals in 2015, making it one of the busiest migration destinations in Canada. Brampton’s close proximity to Toronto makes it very appealing as a relocation destination for professionals and young families. 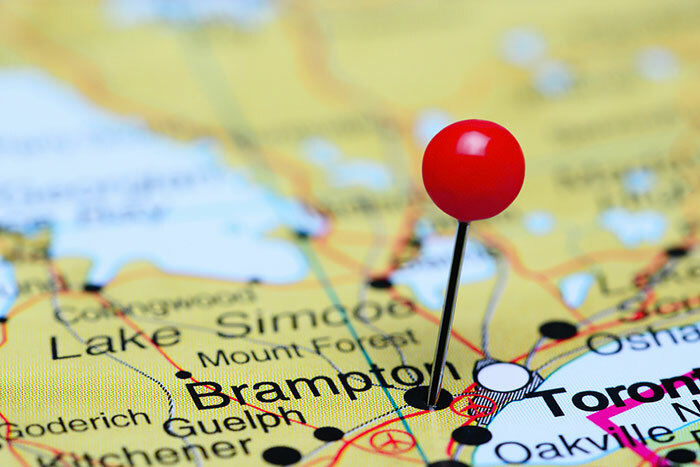 Wondering what’s the best way to relocate to Brampton? You have several options to choose from. The first step is to determine the size of your move (how much is your inventory) and what help you need to make relocating easier for you. You can choose from moving solutions that include U-Haul truck rental, moving labor only, moving container services, or professional moving companies. Each move is different and not everyone can make a DIY move. You’ll also need to check on your moving budget to select the most appropriate moving solution for you. You can compare costs and benefits of moving with professional movers Vs. renting a U-Haul truck to help you decide which works better for you. You could also get actual moving prices from professional movers with free moving quotes to compare costs. Is Brampton an Affordable Place to Live in? Anyone moving to a new city will want to know what it costs to live there. Is Brampton an affordable place to live in? Brampton used to be a small, quiet city but it has become the 9th biggest city in Canada and the 3rd biggest in the GTA (Peel Region). It is a quick drive to the Toronto Pearson Airport and around 42 kilometers to downtown Toronto. It has more than 6,000 acres of beautiful green space that gives residents plenty of options for outdoor activities. It also has 7 beautiful golf courses that golf lovers will surely enjoy. Individuals working in Toronto and looking for a less expensive place to live consider Brampton a good choice due to its convenient location and very low crime rates. Real estate prices are still a bit high but definitely much lower than in Toronto. According to the Canadian Real Estate Magazine, single-detached homes sell at an average price of $588,900. Brampton is a good option for those looking to rent. The median rental for a 1-bedroom apartment in the city is about $1,100, still cheaper than Toronto and other GTA cities. Cost for groceries, transportation and utilities in Brampton are cheaper or at least comparable with Mississauga. Have questions about government services in Ontario? You can check for information on driver’s licenses, health cards, business licenses, and other services you may need to replace or renew for your relocation. Being close to Toronto and more affordable than other parts of the GTA has made Brampton a very ideal relocation destination. This means that all year round, tons of people move to the city from many parts of the GTA and Canada. That being said, moving companies can be fully-booked. It is a good idea to book your selected moving company early. 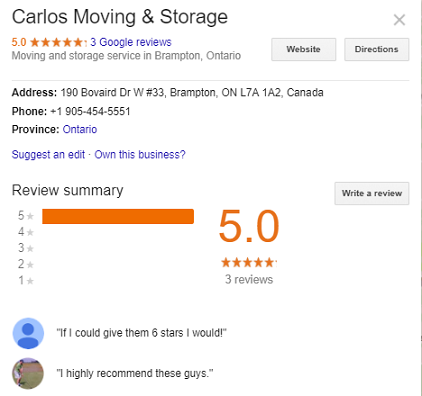 If you are coming from Toronto, most Toronto movers service Brampton on a regular basis. If you want to save money on moving expenses, you can ask movers about economy moves, moving containers, or consolidated moving services. You can choose your best moving company by using free online moving quotes to access best movers qualified and available to relocate you on your preferred moving date. You can save on moving costs by being flexible with your moving date. Moving rates are generally higher during peak season. Arrange for an in-home assessment with your moving company to get an accurate moving quote. Choose movers that are licensed, fully insured and provide transparent and written moving quotes. Find out how moving companies charge for moving services with hourly rates and flat rates to save money. Hiring a good moving company can totally make your relocation pleasant and stress-free. Moving companies offer a wide variety of moving services you can choose from. Before hiring a mover, you need to decide what aspects of your move you need professional help with and how much you can afford to pay. For individuals whose goal is to have ABSOLUTELY NO STRESS during the move, the best option is to get a complete moving service. This means you want your movers to handle the packing and unpacking, disassembly and assembly of furniture, loading/unloading, and door to door transport. Depending on the distance of your move, your moving company will charge you hourly rates (locally) or a flat rate (long distance). For individuals who desire to reduce the work involved in their relocation but want to economize their move, there are several options you can choose from. You can save money from moving expenses with semi-DIY moves. With a semi-DIY move, you do some of the work but delegate some of the tasks to a moving company. If you have an alternative means of transport for your household goods such as a borrowed or rented truck but need help with loading and unloading, you can get moving labor only. Professional movers charge hourly rates for moving labor depending on how many movers you need. Professional movers also offer moving packages for a moving truck with movers. Their rates vary depending on the size of truck and number of movers. Hourly rates apply only for local moves (usually up to 50 miles) from point A to B. For long distance moves, professional movers will provide flat rates based on distance and weight of your inventory. If you hire a moving truck with movers, you have the option to do your own packing. You can also choose to delegate more to your movers such as disassemble or assemble furniture. Movers may charge for add-on services. Moving companies offer professional packing services. If you need help with packing special items or fragile items only, you can choose to add this option to your moving service. You can choose to pack your personal items such as clothing but get professional packers for packing hard to pack items like china, computers, books, kitchenware, mirrors, art pieces, etc. It is also worth mentioning that you can save money from transport of your household goods with consolidated moving services. This means you will be sharing a truck with another individual or family moving to the same area. Consolidated moving can reduce the cost of your moving expense significantly. It is ideal for those who don’t have goods for a whole truckload and can be flexible with the delivery of their cargo. A select number of moving companies offer portable moving containers as a DIY option. The company will deliver your portable container to your current location. You can pack the container with your belongings and the company takes care of delivering it to your new address. You get flexibility with this option because you can choose the length of time you need to get your container packed. You can also choose the size of your moving container. There are also companies in Canada specializing in moving containers. Find out more about how to move with portable moving containers to save on moving costs. As you can see, you have many options for DIY moving than just renting a truck and doing all the work. Talk to our moving partners about affordable moving solutions by requesting for your free moving quotes. The smartest way to find a reliable mover is to compare multiple moving quotes. It pays to know how to spot a good mover and how to compare their moving rates and services. To give you an idea of how professional movers work and what services they offer, we have compiled a list of the top 10 moving companies serving Brampton. This full-service moving company is family-owned and operated. It serves Brampton and all of Ontario for all types of relocation. For almost 40 years, this moving company has been providing stress-free moving services to families and businesses in the GTA. It offers local and long distance moving services as well as packing and storage services. The company is WSIB insured and bonded and employs only full-time and well-trained movers. It offers discounted moving rates each month, from the 2nd to the 23rd. 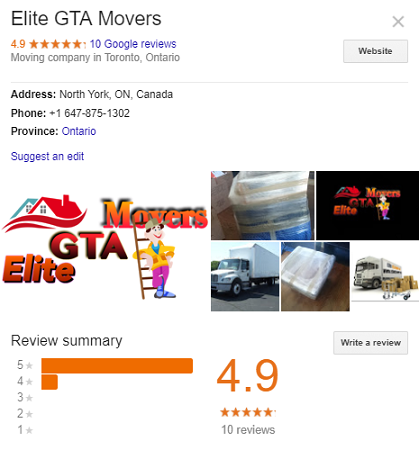 It is affiliated with the Canadian Association of Movers. This moving company has been in business since 1991 and is a family-owned and operated business. It provides residential and commercial relocation services throughout Ontario. As a Brampton moving company, it offers moving, packing, and storage services. It is a proud member of the Canadian Association of Movers and adheres to ethical standards in the moving industry. For those who want to save on moving costs, this moving company provides lower moving rates for moves from the 2nd to the 23rd of the month. 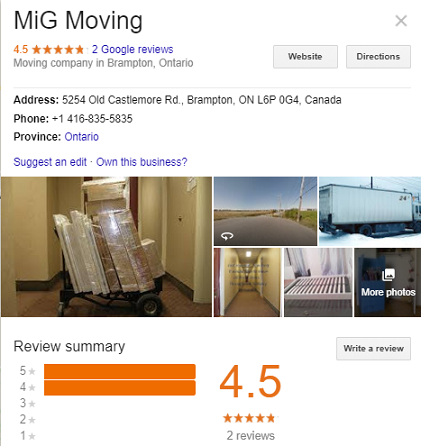 If you are moving your home or business to Brampton, this moving company can do the job for you. 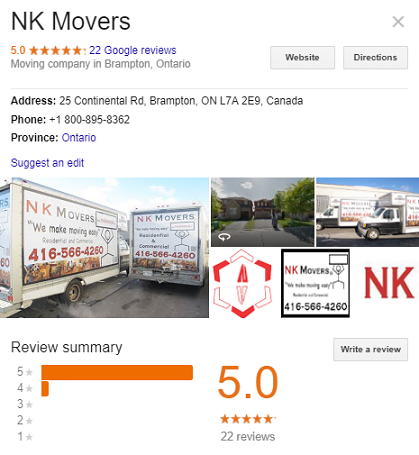 It is part of a franchise of over 350 independent movers throughout North America and serves Brampton, Bramalea, Caledon, Orangeville, Castlemore, Ebenezer, Macville and all nearby areas. 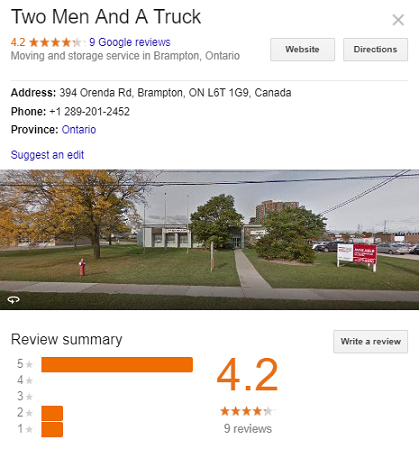 Since it opened its office in Brampton in 2010, the company has developed a trusted reputation as a mover in the community. It also has a climate-controlled and secured 17,000 sq. ft. storage warehouse for individuals who require storage in between moves. This moving company offers local, long distance, and international moving services at reasonable rates. They specialize in senior moving, home moving (condo, townhouse, loft, house), small to medium office moves, student moves, and complete or partial packing. This moving company can move your business to Brampton without unnecessary delays or move your household efficiently and at reasonable costs. The company provides residential moving across Ontario. As an added service, they also provide moving bin rentals for $1 a week. This moving company is accredited with the Better Business Bureau. This premiere moving company serves Brampton, Toronto, and other areas in the GTA. It is a full-service moving and storage company offering local residential moving, coast to coast deliveries for long distance moving across Canada. It also has a commercial division for handling relocation of businesses in the GTA, Montreal, Ottawa, Vancouver, and Calgary. It is a fully licensed, insured, and bonded moving company that is qualified to undertake all types of long distance and international moves. This moving company has been serving the whole of Canada for more than 18 years of industry experience. It is an official moving agent of North American Van Lines. It has locations in Toronto, Calgary, Regina, Moose Jaw, Mississauga, and Winnipeg. It is a member of the Canadian Association of Movers, the American Moving and Storage Association, the International Association of Movers, and the Better Business Bureau. If you are moving in Brampton, Toronto, or Mississauga, this moving company could be your ideal mover. It has been serving the area for more than 14 years and has conducted moves for more than 10,000 happy customers. The company offers all kinds of moving services and storage for your convenience. The company understands the stress of relocation so they take a professional approach to long distance moves. Whether you are moving from Toronto to Brampton or anywhere in Ontario, you can be sure of their exceptional service and accurate moving estimates. This professional moving company is located in Toronto and offers high quality moving services at competitive rates. They serve all of the GTA including Brampton, Mississauga, Ajax, Aurora, Caledon, Markham, Hamilton, Burlington, and all towns and cities surrounding Toronto. They provide local and long distance moving services for all types of residences such as condos, homes, and apartments. The company can provide complete moving supplies and provide assistance with packing, loading and unloading, and storage. Seniors and students can also avail of discounted rates. 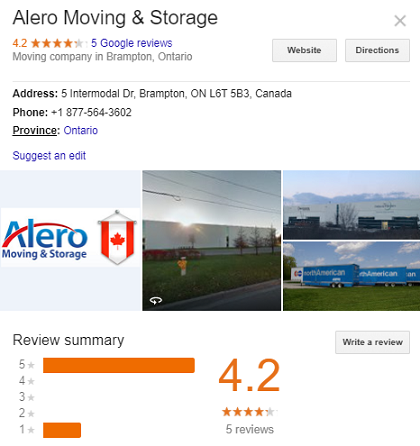 This moving company started in 2008 and provides moving services to all of the GTA including Brampton, Toronto, Caledon, Richmond Hill, Vaughan, Mississauga, and Thornhill. For transport of household goods, the company charges a travel fee of $100 for moving to all parts of the GTA. The travel fee may be more if the distance is beyond 50 kilometers such as from Toronto to Caledon. Moving rates are $80 per hour for truck with 2 movers, $100 per hour for truck with 3 movers, $130 per hour for truck with 4 movers plus the travel fee. There is a minimum charge of 3 hours for all jobs. The company also offers a cheaper option with truck only and driver for $35 per hour plus travel fee. Customers will do the loading and unloading. 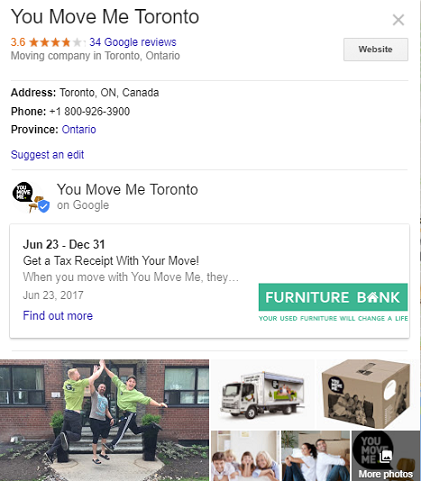 This local Toronto moving company is part of a large franchise of independent movers with locations across the GTA, Ontario, and North America. It has a team of friendly and professional movers that will do all they can to make your move as smooth as possible. The company offers reasonable rates for local or long distance moving from Toronto to anywhere in the GTA or Canada. It employs an all- inclusive and upfront pricing system to ensure that you get no surprises on moving day. Their moving rates include fuel, labor, travel time so you know right away what your moving cost will be. 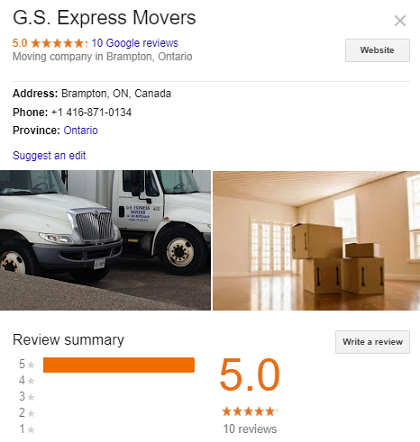 If you are moving to Brampton, this moving company can take care of all aspects of your move including your packing. Your easiest option is always to hire a local company for convenience and economy. But depending on your needs, you can also look further afield and hire quality movers offering more complete moving services from nearby areas in the GTA. 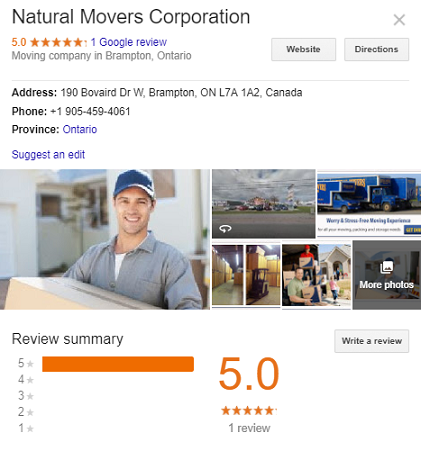 To avoid undesirable moving companies, stay away from movers that don’t have a company name or logo but use only generic names such as Brampton Mover or Brampton Moving Company. Our partner moving companies are all licensed, insured, and reputable. Protect yourself from moving scams by hiring only qualified professional moving companies. We know it’s no fun to have to repeat your moving details over and over on the phone. If you forget to mention one detail to the mover on the phone, you could get a significantly different moving quote. We want to make it easier for you with our single online request form. Take 2 minutes to fill-out the form and receive 5 moving estimates based on your moving details from 5 different moving companies. It can’t get any simpler than that. In one single action, you get access to 5 moving companies offering high-quality moving services. This allows you to compare different moving quotes to find the best price. Best of all, our moving quotes are free and no obligation. 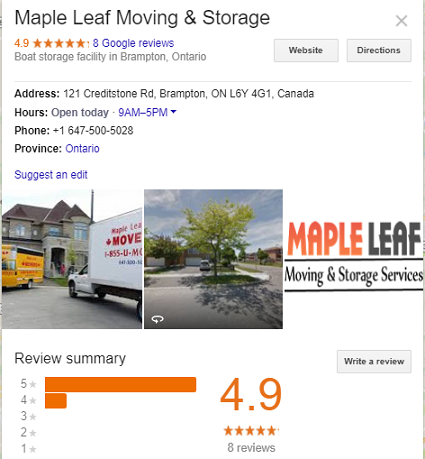 Find the right moving company for relocating to Brampton with 5 movers’ quotes from our licensed and reputable moving partners.